Today, we have two more clutter hotspots to talk about. The first is clutter caused by items you intended to sell. And the second is book clutter! So let’s get to it now! Clutter hotspot #8: Stuff you want to sell. I have debated the merits of selling items on my blog a few times. (Here’s a link to one such post: To Garage Sale or Not to Garage Sale?). So I won’t go into that again…but I will call on the recurring theme for this series: to avoid clutter you must have enough space to store your stuff. If you’re going to sell items without creating clutter in the process, you’ve got to carve out storage space for the items to be sold. I sell items from time to time now. I make this work without causing clutter by allocating storage space in my office closet for items to sell. This strategy also allows me to list items for sale when time permits and when the item is in season and more likely to sell. It’s a win-win. Now most of us don’t have empty shelves sitting around waiting for a new purpose, so you might have to get creative to find a storage area for your items to be sold. Could you add an under-the-bed storage bin? Could you declutter a shelf of old craft supplies and allocate this area as your storage zone for items to sell? Once you have your storage spot in mind, as always, set limits. Don’t keep more items to sell than you have the storage space or time to accommodate. Prioritize your time and space by selling higher dollar items, and passing along lower value items to charity. Clutter hotspot #9: Books. Alright, you know the drill. Make sure all of the books in your home have an “away,” a place to go when they’re not being read. If they don’t, donate some books or purchase some bookcases. 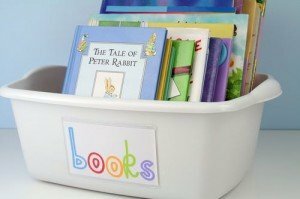 Next, store young children’s books in a bin or basket with the covers facing forward. This will make it easier for your pre-reader to find his or her book of choice, without pulling all of the books off of the bookshelf. (Hooray!) Finally, using the library is an excellent clutter prevention tactic. Just be sure to assign a specific spot for library books, such as a basket by the door or a special section of a bookcase, so they’re easy to find and return when they’re due. Alright friends. Two more clutter hotspots tackled! Are you feeling more ready to send your kiddos back to school? I’d love to know if you’ve taken action on any of the ideas I’ve shared this week. Let me know in the comments! Hello and thanks for sharing info on such a valuable topic. I was wondering where you purchased the book storage bin that you have pictured in this post.